The Golden Nugget now takes up the entire block between First and Second but it hasn't always. On the corner of First and Fremont once stood the California Club which had an animated bear that moved its head up and down. In the mid-1960s, the bear would be replaced by an animated chaser bulb arrow. In 1969, the Golden Nugget expanded and put a small bullnose on the corner. In 1978, the Friendly Club opened on the corner but within two years, it closed and reverted back to being part of the Golden Nugget. In about the mid-section of today's Nugget, once stood the Oasis Cafe. This was a popular restaurant with both the locals and people passing through. The Oasis gave way to the Las Vegas Sweet Shoppe. The Sweet Shoppe was a popular after school hang out for students from the Grammar and High Schools. The Sweet Shoppe ultimately closed and the White Spot Cafe opened in its place. In 1954, the White Spot gave way to The Nevada Club. The Nevada Club, like most of the gaming halls on Fremont Street had air vents on the floor in the doorways. You could come in out of the heat, stand there and be blasted by cool air. The floor vents are still in the doorways but that rush of cool air no longer hits you like it used to. The Nevada Club gave way to Diamond Jim's. Finally, around 1970s, it too became part of the Golden Nugget expansion. Between the Nevada Club and the original part of the Golden Nugget stood a small clubs: the Fortune Club which became the Frontier Club. The Frontier Club became the Lucky Strike with its massive neon and flicker bulb pylon sign shooting into the sky. The Lucky Strike shortened its name to the Lucky Club before being annexed by the Nugget in 1968. This originally was a two story Post Office. Robert Griffiths was the postmaster in 1926. Next to the Post Office was the Majestic Theater which may have been owned by Ernie Cragin before he built the El Portal. Cragin and Pike Insurance had an office upstairs above the Theater. The Post Office and Majestic Theater gave way to the Mission Bar. It was only in business a short while before it became the Kiva Bar. The Kiva gave way to the Golden Nugget. It's original bullnose and signage was designed by Young Electric sign designers Kermit Wayne and Hermon Boernge. The 1905 on the sign led many to believe that the Golden Nugget had been part of the original development of Fremont Street but that was a myth. 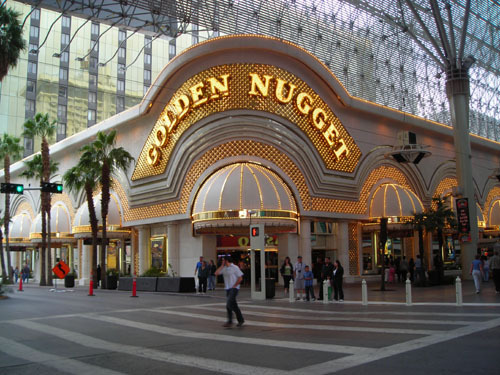 Because of its bullnose and signage, the Golden Nugget became one of the most photographed buildings on Fremont Street. 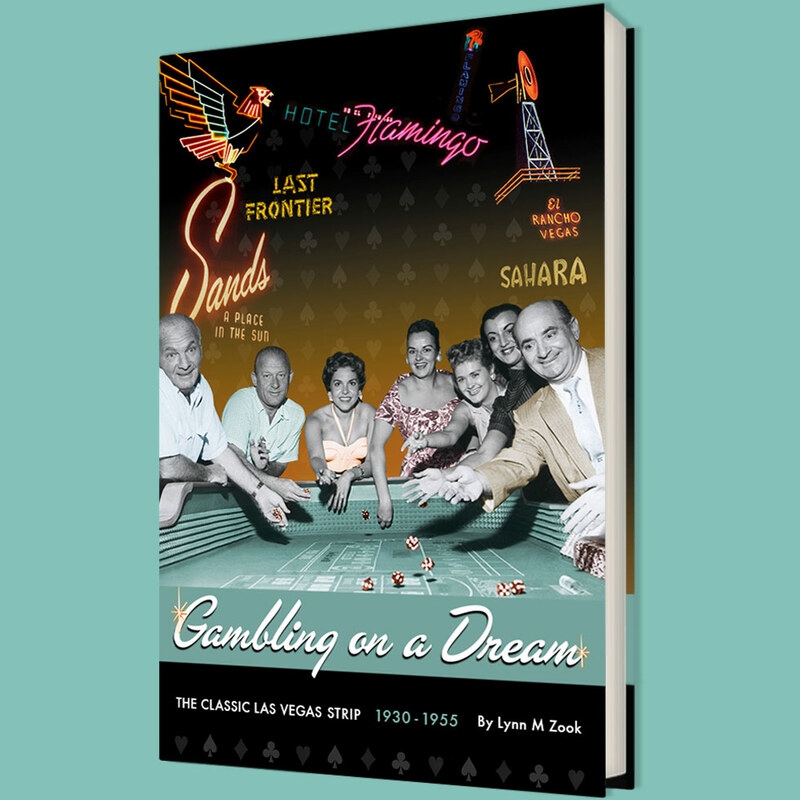 "Everyone knew the Golden Nugget sign" said the late president of the LVCVA, Manny Cortez. Steve Wynn bought the Golden Nugget and gave the building a total make-over. Some of the smaller signage is in the Neon Museum boneyard but the original large rooftop sign was destroyed. There is reported to be a small model of the original bullnose and signage in the Smithsonian. Outside on Second Street for many years was Sammy's Newstand that carried papers from around the world.